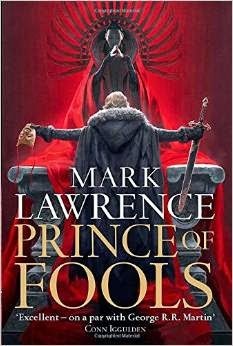 Prince of Fools is the start of Mark Lawrence’s latest peregrination into the world of the Broken Empire – first explored through the damaged, driven, dangerous Prince Jorg in Prince of Thorns. The protagonist of Prince of Fools is a totally different animal. Lawrence has exercised considerable skill here to give his new protagonist, Prince Jalan, an entirely distinct voice. That voice is equal parts wit and cowardice – though there is a surprisingly deep emotional well hinted at throughout the text. In any event, Jalan is a minor scion of the Red March, a major nation in a shattered Empire, led by the formidable Red Queen. Jalan is quite happy to stay minor – spending his days s[ending money, mostly on wine, women and…well, more wine, really. He’s introduced whilst hitting a man from behind whilst fleeing from the bed of the man’s sister, and really, matters don’t improve from there. He’s a coward and sometimes a buffoon – but what makes him readable is his wit. The wry remarks of a man lazily comfortable in his own selfishness, prepared to lie, cheat and steal in order to look after his own interests – and if at all possible, to look good while doing so. Whilst Jorg was, in some ways, representative of the danger and damage that lurks in the hearts of all men, Jalan is less, and more – he feels less like a hero, or an antihero, less a literary construction than a person. Not a particularly nice person, not an altruistic person, not a good person – but a person, one acting as the reader might, in ways we can understand, empathise with, and, often, laugh at. Brief digression: This is a very funny book, at least in parts. Jalan’s observations on the hopeless nature of heroics are especially hilarious, along with his frustration that everyone around him seems to be a violent psychopath, or otherwise determined to do him harm or rope him into their plotting. Jalan is paired up quite quickly with Snorri, a slightly grim Viking. At first glance, Snorri acts as a grounding influence on Jalan. Where Jalan flits between entertainments, keen to be the man he is, rather than the man he’s expected to be, and is particularly good at evading consequences, Snorri is a man dedicated to his family, and to being the man he wants to be, perhaps tired of being the man that he is. Their relationship is the cornerstone of the text, and it’s wonderfully portrayed – a shift from pragmatic self-interest, through camaraderie, into a kind of deeper interaction. Snorri provides a lot of the emotional heft of the text, at least initially – Jalan is a self-interested womaniser, dragged into an adventure against his own inclination (and partially to evade debt collectors), but Snorri has a wife and children to find as part of their journey, and his revelations of his story to Jalan over the course of the novel are a strong influence on both their characters. The supporting characters are a bit less well defined, but most of them are fairly incidental to the central interaction between Jalan and Snorri – still, at one stage the reader is given a look at a small band of Vikings, and it would have been nice to know more about them before the inevitable Dirty Dozen style mission that they go on with our heroes. Make no mistake, this is also a journey novel. It’s reminiscent (possibly intentionally) of the movements of a Nordic saga. Jalan and Snorri move from the warm climes of what might pass for southern France, up into the permanent ice fields of what could be Norway, struggling under the crushing weight of centuries of ice. Along the way, they encounter several ambivalent wizards, an extremely disturbing sorceress, a small horde of Vikings, and the walking dead. And that’s not the half of it. There’s a lot of action wrapped up in this elaborate character piece – and not all of it is Jalan running away from something. The plot starts with a nice slow burn, and ratchets up wonderfully – the action feels paired with the emotional investment of the characters. As you become more attached, so the plot draws in toward what is, frankly, an action-packed conclusion. The prose is typical Lawrence – the environments will surround you, wrap you in their words, fill you up and leave you feeling their heat – or, more typically in this case, their frigidity. Each sentence is carefully crafted – the descriptions of places draw you in, the dialogue between characters is human, and entirely believable. Where Lawrence excels here is in the emotional impact of his words – where some scenes are lightweight, they still manage to crack a smile . Others will, without question, try and crack into your heart with their stark vulnerability, with their honesty, and with their attempt to bring out the reality of being human. Overall, this is a wonderful book; the plot will captivate, terrify and delight . The world will disturb, and intrigue. The characters will amuse, entertain, then break you down in tears. Don’t hesitate – pick up a copy, read it, and see where it takes you.